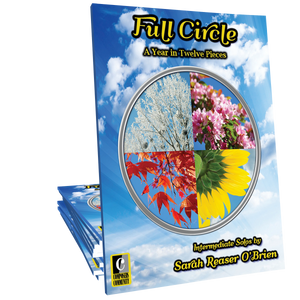 October is an intermediate new age piece by Sarah Reaser O’Brien, NCTM. The constantly moving triplet figures in both hands are meant to evoke the swirling motion of colorful autumn leaves blowing about in the breeze. Rather than centering on a traditional melodic line, October allows students to create a mood or effect by experimenting with dynamic inflection and rubato to vary each performance. Dynamic indications in the score are merely suggestions – performers are meant to make this free-flowing piece their own.